Okay, I’ll admit it. Not like it was such a secret, but I am such a kitchen dork, you guys! I could list examples to prove my point, but I’m sure it’s a bit obvious already – there has to be a certain level of geekery to attempt a project like this one. But my point is that I enjoyed last week’s variations on beer bread so much that I’m doing another round of variations on a theme this week. Awesome! Last week, I featured variations on a particular recipe, but using the same method (with the exception of the yeasted version) for each. This week, I’m making six different breads, all from the same dough, but treated differently through various ways of mixing and rising. And whereas last week’s breads were (mostly) chemically-leavened quickbreads, this week, it’s all about the yeast. What I’m trying to figure out, this week, is how the exact same ingredients end up when handled differently. I mean, we’ve all heard that using a sourdough starter makes for a better bread, right? Well, how much better? Does a 20 minute autolyse actually make your bread taste more complex? Sure, I’ve read the books, studied the masters, made a few loaves in my time, and all that jazz; but it turns out I’m a bit of a Doubting Thomas. Darnit, I need to taste the difference myself! The ingredient list for this dough is intentionally simple, just flour, water, salt, and yeast. There’s no sugar to help the yeast, no milk for a bit of flavor, no oil for softness. No, I want the real flavors to shine through. It’s not about perfection this week, it’s about tasting subtle shifts in flavor, and watching for differences in texture. This dough is fairly wet, so if you’ve got a stand mixer, use it. If not, you can make these breads by hand, but just be careful about how much flour you add while kneading. The first bread for this week is about as simple as it gets; today, I’m using the straight dough method. What this means is that you mix all your ingredients together at the same time, immediately knead the dough until the gluten is properly formed, let it rise until doubled, shape it, let it double in size again, and bake it. Nothing special, other than the use of the aforementioned wet dough. I’ve found, this year, that the wetter the dough, the better the bread. My loaves might end up squatter than many, but the texture inside is beautifully airy (if I do say so myself)! Better that than end up with a dense, dry bread (like I was making at the beginning of this year, if I’m honest). Just to keep everything on an even keel, I’m going to be shaping these breads all the same way, in a fat oval, with three slashes just before baking. All of these will be baked with steam; and if you’re not familiar with steam baking methods, Baking 911 has all the usual suspects towards the bottom of that page. Also, since I have a baking stone, I’ll be using it. If you don’t have one, you can make one with unglazed tiles or quarry stone, or simply use an upside-down baking sheet preheated with the oven, or the oven floor itself. This will produce the most crisp crust, but if you can’t be bothered, you can just bake the bread on a baking sheet, which is fine too. So, to critique the straight dough bread: pretty good. The dough rose nicely, felt properly soft and elastic, and baked into a pretty loaf with a nicely crisp crust. The color was a lovely golden brown, and the interior was evenly punctuated with air holes. The flavor was fairly standard white bread, but nothing too interesting, however. I wouldn’t turn it down, but I wouldn’t call it fabulous. Overall grade: A-. Stay tuned tomorrow, when I explore the mysteries of the autolyse! Same bread time, same bread channel! 1. In the bowl of a stand mixer, whisk together all but a handful of the flour and the yeast. Whisk in the salt. Add the water and mix with the dough hook at low speed until a rough dough forms. Scrape the bowl if needed, and increase the speed to medium-low and knead for 6 to 8 minutes, or until the dough forms a cohesive ball that clears the sides of the bowl, and becomes elastic. If the dough does not clear the sides of the bowl, add the reserved flour until the proper consistency is achieved. The dough should not be stiff. 2. Turn the dough out onto a lightly floured surface, and knead a few times, forming the dough into a round ball with a skin stretching over the outside. Transfer to a lightly oiled bowl, smooth side up. Cover and let rise in a warm place until doubled in size, about 1 hour. 3. Line a large baking sheet with parchment paper. Gently deflate the dough, and turn out onto a lightly floured surface. Flatten the dough into a slight rectangle or oval shape. Fold the two corners furthest away from you into the center of the dough, as though you were beginning to fold a paper airplane. Starting with that point, roll the dough up into a cylinder, pressing gently to seal as you roll. Press the final seam to seal. Transfer the dough to the prepared baking sheet, seam-side down. Tuck the ends under if desired, to make a more attractive loaf. Cover loosely with lightly-oiled plastic wrap, and let rise until doubled in size, about 1 hour. Thirty minutes before baking, preheat the oven to 425º F, and place another baking sheet or oven-safe pan in the bottom of the oven. If you have a baking stone, heat it with the oven. If not, your baking sheet is fine. 4. 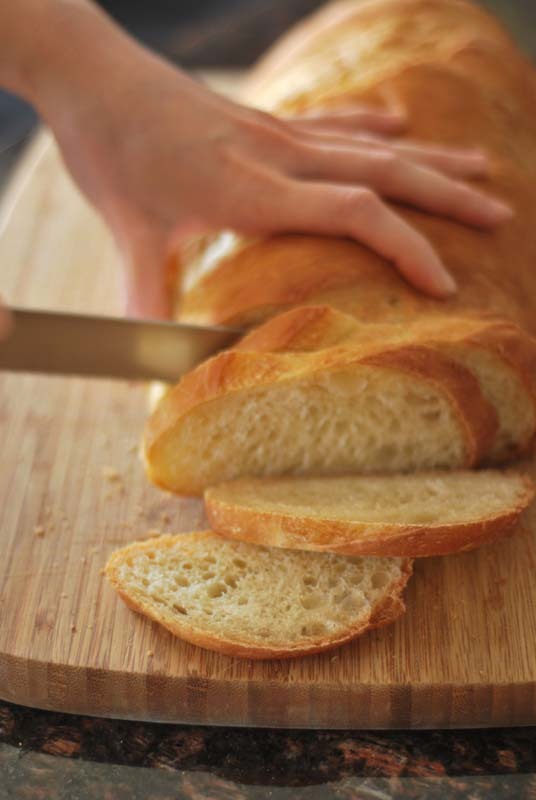 When fully risen, and using a sharp serrated knife or clean razor blade, make three decisive slashes in the top of the loaf at a 45º angle, evenly spaced. Transfer the bread to the oven (or baking stone, if using). Immediately throw 4 or 5 ice cubes into the hot pan on the oven floor. Bake for 10 minutes, adding additional ice cubes as they melt. 5. After 10 minutes, remove the ice-cube-pan from the oven, and bake the loaf for an additional 15 to 25 minutes, or until deeply golden brown. Remove the bread to a wire rack to cool before slicing. 1. If using active-dry yeast, your water should be a bit cooler, around 105º F to 115º F. Instead of mixing the active-dry yeast into the flour, you should dissolve all of it in a little of the warm water, in the mixing bowl. Let stand for about 5 minutes, or until foamy. Add the flour and salt, and proceed as directed. Terrific blog – I’ve bookmarked and hope to learn to bake bread as well. I made a beer bread last week and a whole wheat loaf yesterday. Good stuff but not sandwich quality, which at this point is what I want. Maybe you have suggestions? Yeah, the beer bread is good, but it’s way too crumbly to use for sandwiches. 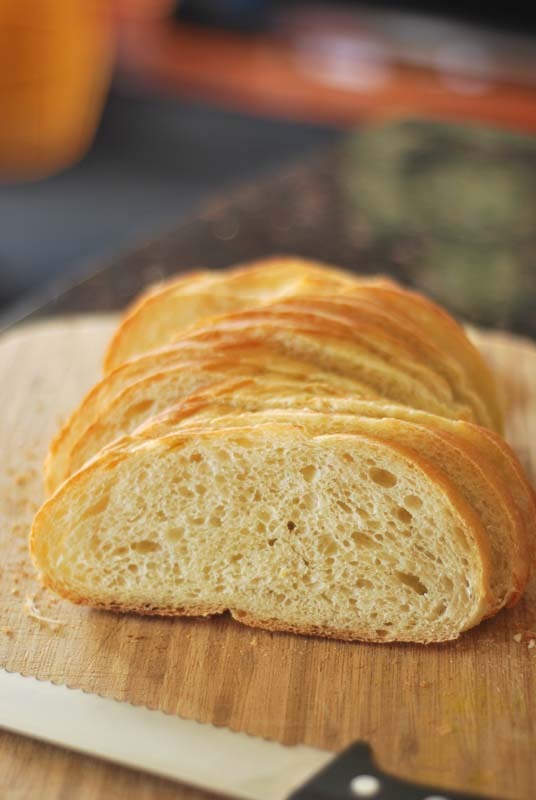 For sandwich bread, I’ve got a few recipes that I’ve enjoyed. Here is a good white sandwich bread, or if you prefer 100% whole wheat, these two are very good options. This was a good rye bread, but if you’re adventurous, this is actually one of my all-time favorites. It’s spicy and quite good, if not the most amazingly-textured bread ever. Best of luck to you in all your breadmaking! If you ever have any questions, feel free to contact me – I’m always happy to help! Thanks a lot – those recipes look great. I don’t have a mixer, can these be done by hand if needed? These recipes can absolutely be made by hand. Just be careful about how much flour you add while kneading by hand; it’s very easy to overdo it and end up with a dense bread! Better to wash dough off your hands than end up with a bread-brick, I say. If you’re serious about making bread on a regular basis, though, I’d highly recommend investing in a stand mixer (or ask Santa for one). I was staunchly against using one for many years (out of some innate Luddite tendencies), but they let you work with far wetter doughs than you’d be able to knead by hand. Wet dough = more airy bread and a more artisanal end product. That’s my personal preference; but you can absolutely make any of these by hand. As long as you’re making bread, I’ve done my job! It ain’t over till its over. And buttered. And eaten.